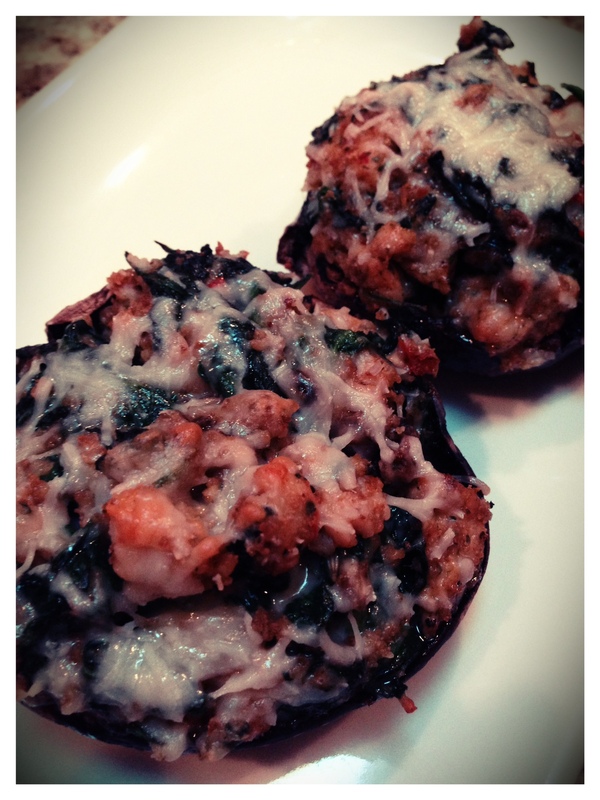 Spinach, Sausage, and Asiago Stuffed Portobello Mushrooms | Kitchenpants! You know what’s great about stuffed mushrooms? The possibilities are endless. Really. You can stuff a mushroom with just about anything. You can prepare stuffed mushrooms as an easy appetizer (stuff early, bake, and voila – gourmet!) or as a meal. This recipe produces a very hearty mushroom, so it’s more to a meal than an appetizer. Portobello Mushrooms – As many as you like. The ingredients for this recipe will stuff 6 medium or 4 large mushrooms. Double as needed. You can also use smaller mushrooms if you like (See? Endless!). 3 Large Links of Hot Italian Chicken Sausage – about 3/4 of a pound or so. You can adjust this amount to your taste. If you want a more meaty mushroom, use more. 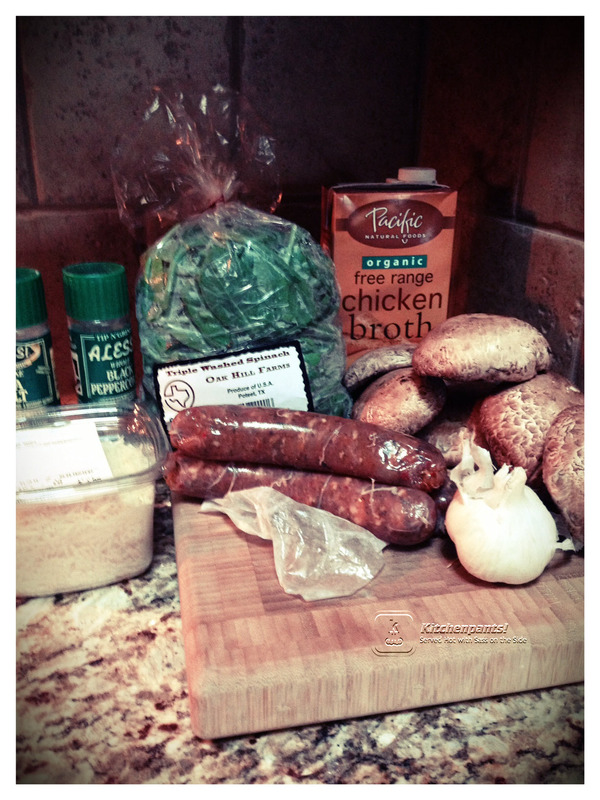 I buy fresh chicken sausage from my local meat counter and for this recipe, I prefer the hot to the sweet. You can use regular Italian sausage, too, if you like. 8 oz Fresh Spinach – Do fresh. I can’t guarantee anything about this recipe if you use frozen. 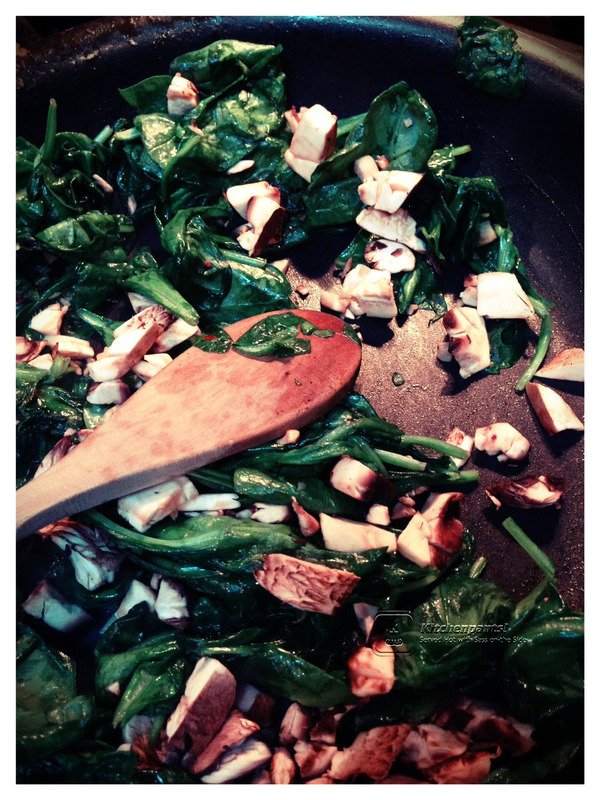 Skillet – I will admit that I used a non-stick skillet for this because I didn’t want the spinach to stick. So, I will now amend my previous statement to say that non-stick skillets are for eggs and leaves. 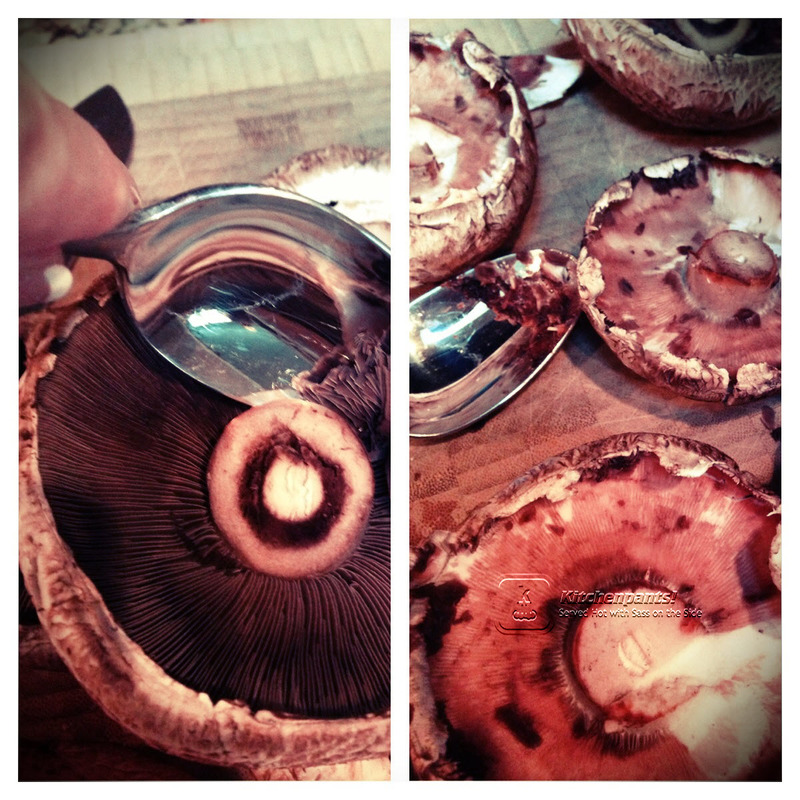 Wash the mushrooms: Do this by slightly wetting a paper towel and rubbing the surface of the mushroom gently. Set the mushrooms aside. If you like, you can chop one up to add to the stuffing mix. This is up to you. Slit the sausages and spoon the meat out of the casing. Spray down the pan with a little cooking spray. Brown the sausage meat, but don’t overcook it. If you are using chicken sausage, there shouldn’t be too much fat in the pan. Drain any fat and move the sausage into the mixing bowl. Set aside. Chop up your garlic clove. In the same skillet, drizzle your teaspoon of olive oil in the pan. Heat over medium heat. Add the garlic and stir around gently. You do not want to brown garlic as this will make it bitter. Let it become a light golden color. This will flavor the oil and eventually, the spinach. Add the spinach to your pan. Don’t fret if you have an overflowing skillet of spinach to start – it will cook down. Turn it over in the pan and allow the oil and garlic to mix in. Add the teaspoon of chicken broth. Add the sausage and let it heat up just a tad (it should still be warm from cooking). When the spinach is ready, it will be broken down but not overly mushy. Dump the spinach mixture into the mixing bowl. Add the breadcrumbs, pepper, and asiago cheese. Don’t add the salt yet. Fold the mixture together. Taste it. Yes, taste it…there’s nothing in the mixture that you can’t eat straight. If you don’t like it on the spoon, it won’t be any better when you put it into a mushroom. Do not worry if it tastes a little salthy. Asiago cheese is salty and the sausage and broth may add to this. Once you stuff the mushrooms, the mushroom will cut the saltiness. If the mixture needs salt, add it now and be conservative. Stuff the mushrooms with a spoon and place on a baking sheet. Drizzle each mushroom with a little olive oil.